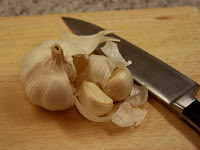 How To Peel Garlic...Like a Boss! I found the video below over at saveur.com of how to completely peel a whole head of garlic in about 10 seconds with out using any of those gimmicky tools sold by gourmet stores or late night infomercials or even a paring knife! It's a pretty slick trick! You can find lots of tricks and techniques as well as recipes over at saveur.com. They're my new rss entry for foodie goodness! Also here is a tip of my very own that I'm sure most of you know already. The tip works for those times when you've slightly been handling fish, onions and especially garlic. If you're cutting up a bucket of onions, garlic or frying up a school of fish then this will likely not work as the odor has been absorbed into your skin so I'd suggest using latex gloves when handling those items in large quantities. So you've miniced a few cloves of garlic and you didn't put on gloves an you can smell the garlic smell from your fingers. First rinse off all solids with clear cold water from the tap, then immediately rub your hands on something that is stainless steel. You'll notice that the smell has disappeared or is diminished! NEAT! The science around this is that the steel reacts with the sulfur compounds when those items are cut (those same compounds that make you cry when you cut up onions) and thus removes or diminishes those compounds/odors. The cool thing is you don't have to buy those specialty "steel soap bars" either any piece of stainless will do! Lucky for me my entire apartment sink is stainless steel!